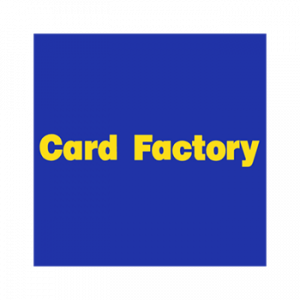 Card Factory are the leading specialist retailer of greeting cards, gif dressing and party products. Not only do they sell greeting cards, you’ll find a huge selection of gift ideas, an array wrapping paper, balloons, gift bags and so much more in-store. Card Factory’s mission is to help customers celebrate their life moments by providing a range of quality cards, wrap, dressings, party gifting products at value prices. The group principally operate through a chain of over 900 stores across UK and Ireland. The company commenced operations in 1997 with just one store and has expanded its store estate primarily through organic growth to become a market-leading value retailer. At Card Factory, they want to make it as easy as possible for you to celebrate every special occasion. Whether it’s a personalised card, pretty gift box or all the supplies and trimmings you need for a fabulous birthday party, Card Factory have all you need to get everything wrapped up! Choose something you know they’ll love from the in-store gifts range to put a smile on their face and add something special to their day. With scented candles, soft toys, mugs and more to pick from, it’s easy to buy a present that comes from the heart. As well as a fantastic range, Card Factory offer outstanding quality at exceptional prices. This means not only can they not be beaten on price, you know you are getting the best possible cards and gifts while also saving money. The company design, print and make most of their products in the UK, so they can ensure the highest quality, whether it’s a birthday card or Christmas gift bag. Card Factory design and print their own ranges so you won’t find them anywhere else. No matter what the occasion, you’ll find everything you need at Card Factory to help make it a brilliant day. With cards and gifts to suit all budgets, they can help you get ready to mark every special occasion in style.